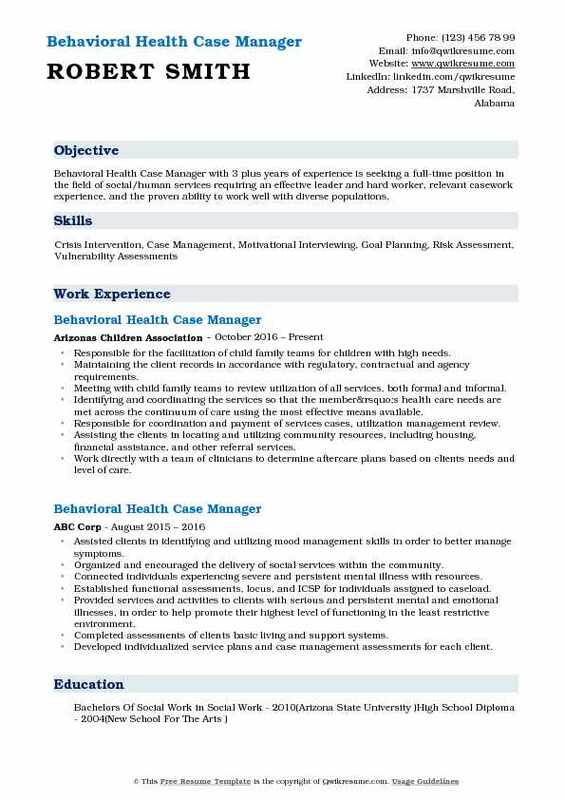 The job description of a Behavioral Health Case Manager generally covers a whole range of job tasks. 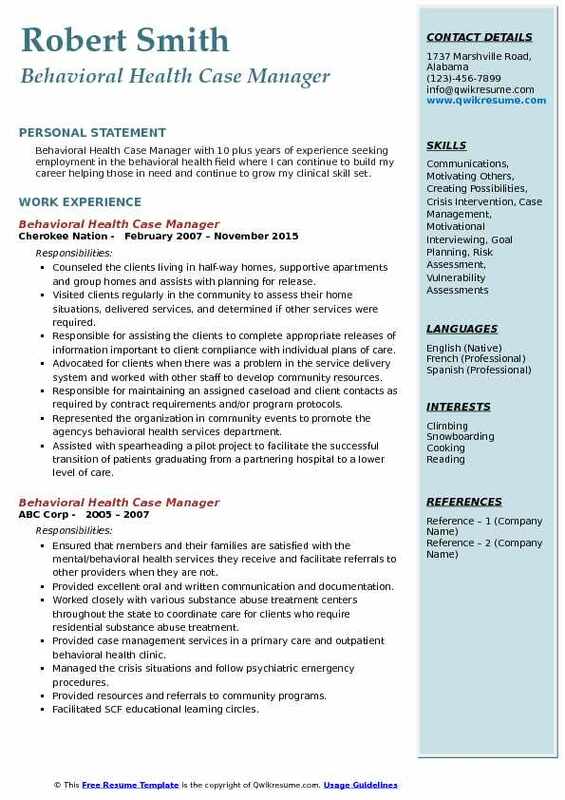 A well-crafted Behavioral Health Case Manager Resume mentions duties such as – identifying people in distress, evaluation of clients, handling case assignments, reviewing case progress, facilitating multiple case aspects, managing staff care employees, making referrals and treatment plans, monitoring recovery progress and making home visits if necessary. Behavioral health case managers are expected to demonstrate excellent knowledge of case management principles and healthcare management, have familiarity with emerging technical skills and be an excellent communicator. They should have the ability to multi-task and be a good listener. Behavioral health case managers highlight backgrounds either in the field of nursing, social work, mental health, human service, psychology or the like. Objective : Behavioral Health Case Manager with 2 plus years of experience is seeking a position within the health industry related to mental health and/or behavioral healthcare field. Work well with others as a team and an energetic self-motivator able to work individually. I am always looking to learn new things to further my education so I can be more successful at educating others. Screening and receiving the phone calls in a courteous and timely manner, determining the nature of requests and provide the information desired using privacy rules and established processes. Independently managing the position responsibilities with little supervision. Developing and maintaining the effective working relationships with all clinical and administrative staff. Developing and maintaining the effective working relationships with community agencies, provider agencies and law enforcement to coordinate services. Managing the referrals for behavioral health services amongst El Rio Community Health Center. Facilitating the adult recovery team meetings for the purpose of coordinating care. Completing the ongoing assessments of need and service intensity with the use of the ASAM assessment. Developing the treatment plans and set achievable treatment goals with the member based on the psychosocial assessment. 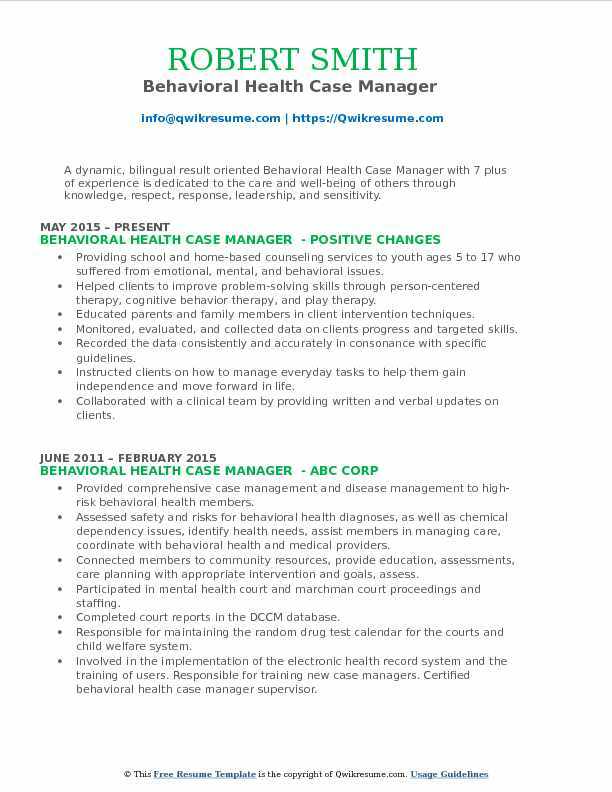 Summary : Behavioral Health Case Manager II with over 18 plus years of work experience in social service industries. Managing every aspect of a successful financial management office for those deemed incapable of handling their personal finances; also developing and implementing workplace policy and procedures. Professional interpersonal skills, self-starter and initiates assignments with minimal supervision. Providing case management for the homeless, SMI adults and working with other social service agencies to the asset in providing the best possible care. Assisting, maintaining, monitoring and modifying covered behavioral health services for recipient’s in finding necessary resources other than covered services to meet basic needs. Serving as a point of contact and ensuring ongoing collaboration with the clinical team, behavioral and medical care providers, community resources and other involved supports of the recipient. Ensuring the provisions of all covered services identified on the recipient's Individual Service Plans (ISP), referrals to community resources and coordination of care activities relating to continuity of care between multiple providers, services, and supports. Providing outreach and following-up of services such as crisis calls, missed appointments and referrals ensuring adequate resources are available and in place. Ensuring the development and implementation of transition, discharge and aftercare plans prior to discontinuation of behavioral health services. Performing all case management functions associated with caseload including completing the assessment and service planning processes. Collaborating with the recipient and his/her family or significant others to implement an effective service plan, explaining the available clinical options to the team, including the advantages and disadvantages of each option. 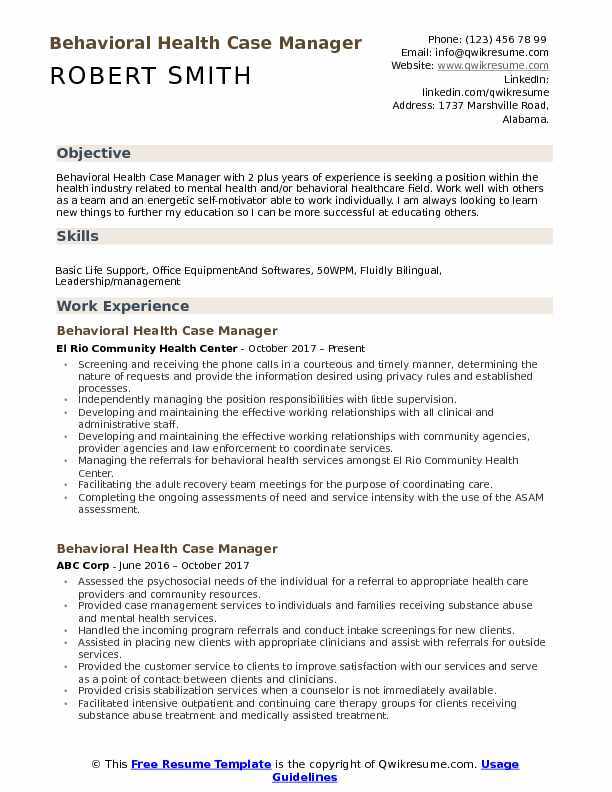 Summary : Companionate and highly dedicated Behavioral Health Case Manager with extensive experience of 8 years in the Mental Health field. Proven ability to work collaboratively and independently to provide quality services to at-risk populations. Skilled in needs assessment, counseling techniques, and interventions. Core Qualifications Assessment Resource Linking Goal Setting Treatment Plans Inter-Agency Communication Life Skills. Assisted with and had prepared reports such as parole review summaries and security reviews. Used interview techniques and assessment instruments to determine the offender's security risks and programmatic needs. Advised offenders on personal problems, employment resources, vocational skills, educational and training needs and institutional adjustment. Developed and monitored offender transition plans in line with re-entry programs and services. Had done collaborative work with relevant partners to provide support, pre and post-release services for offenders which involve family members and community resources and social service agencies. Communication with team members, facilitated and maintained communication with the individual or their representative, other team members, providers and other relevant parties to ensure the individual receives the maximum benefit of their services and that any adjustments to the service plan are made as needed. Coordinated a seamless transition for beneficiaries from an inpatient setting to community-based services. 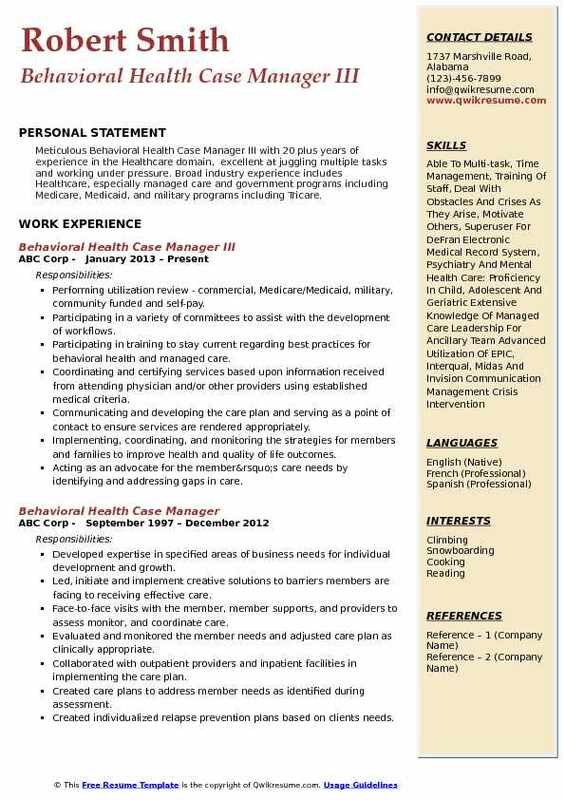 Summary : Highly empathetic Behavioral Health Case Manager and problem solver with 7 plus years of experience and with a knack for developing creative solutions to complex problems. Seeking a position with the opportunity for new challenges and professional development and advancement. Coordinating the child protective team and providing case management to child abuse/neglect cases. Coordinating the annual child abuse prevention fair and providing guidance to fairs organizing the committee. Promoting child abuse and neglect prevention activities in Sandia community. Providing education and assistance in parenting support to native community members. Coordinating and facilitating the visitation program as recommended by the trial court. Providing case management and referral services for behavioral health caseload. Managing, developing and locating the behavioral health services for children, adolescents, adults, couples, and families. Maintaining reports and ensuring that clinical charts are accurate. Providing the case management, referrals and intake support to community resources for substance abuse and behavioral health treatment. 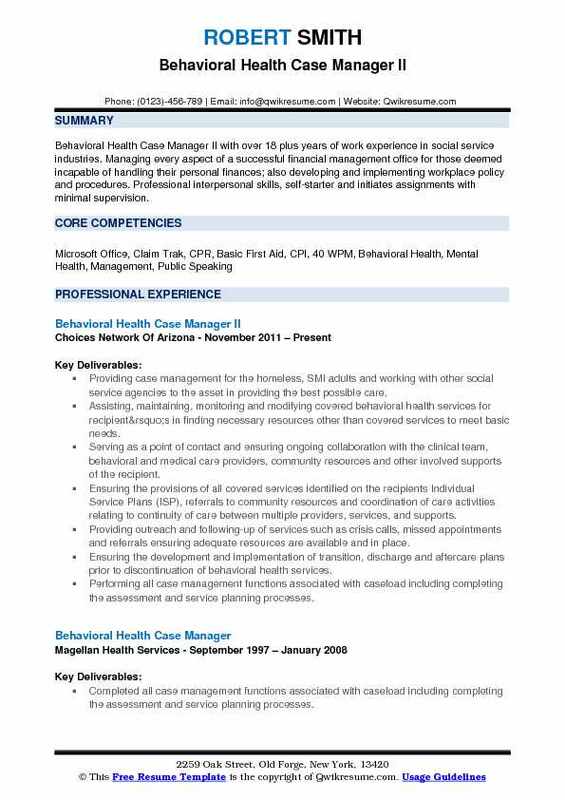 Summary : Behavioral Health Case Manager with 10 plus years of experience seeking employment in the behavioral health field where I can continue to build my career helping those in need and continue to grow my clinical skill set. Counseled the clients living in half-way homes, supportive apartments and group homes and assists with planning for release. Visited clients regularly in the community to assess their home situations, delivered services, and determined if other services were required. Responsible for assisting the clients to complete appropriate releases of information important to client compliance with individual plans of care. Advocated for clients when there was a problem in the service delivery system and worked with other staff to develop community resources. Responsible for maintaining an assigned caseload and client contacts as required by contract requirements and/or program protocols. Represented the organization in community events to promote the agency's behavioral health services department. Assisted with spearheading a pilot project to facilitate the successful transition of patients graduating from a partnering hospital to a lower level of care. 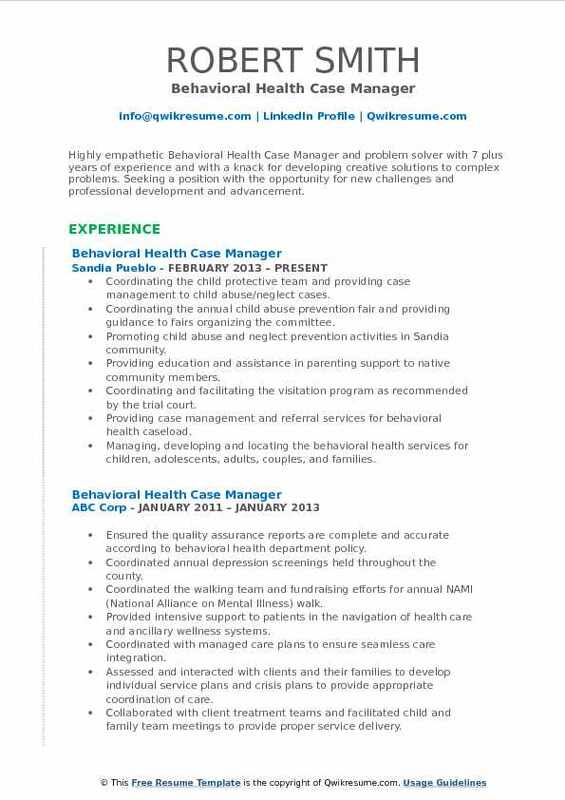 Objective : Behavioral Health Case Manager with 3 plus years of experience is seeking a full-time position in the field of social/human services requiring an effective leader and hard worker, relevant casework experience, and the proven ability to work well with diverse populations. Responsible for the facilitation of child family teams for children with high needs. Maintaining the client records in accordance with regulatory, contractual and agency requirements. Meeting with child family teams to review utilization of all services, both formal and informal. Identifying and coordinating the services so that the member’s health care needs are met across the continuum of care using the most effective means available. Responsible for coordination and payment of services cases, utilization management review. Assisting the clients in locating and utilizing community resources, including housing, financial assistance, and other referral services. Work directly with a team of clinicians to determine aftercare plans based on clients needs and level of care. Provide comprehensive case management services to members of a medicaid managed care plan. Summary : A dynamic, bilingual result oriented Behavioral Health Case Manager with 7 plus of experience is dedicated to the care and well-being of others through knowledge, respect, response, leadership, and sensitivity. Providing school and home-based counseling services to youth ages 5 to 17 who suffered from emotional, mental, and behavioral issues. Helped clients to improve problem-solving skills through person-centered therapy, cognitive behavior therapy, and play therapy. Educated parents and family members in client intervention techniques. Monitored, evaluated, and collected data on clients progress and targeted skills. Recorded the data consistently and accurately in consonance with specific guidelines. Instructed clients on how to manage everyday tasks to help them gain independence and move forward in life. Collaborated with a clinical team by providing written and verbal updates on clients. Worked in conjunction with behavioral health technicians and nurse to ensure that coordination of behavioral healthcare services goes uninterrupted from the assessment process through the treatment/services options with reassessment as appropriate. 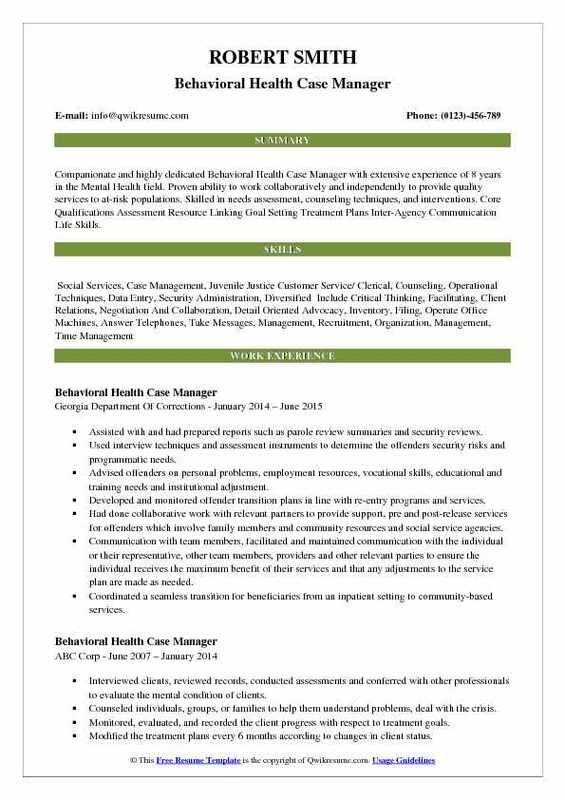 Objective : Behavioral Health Case Manager with 3 years of experience is seeking to utilize the skills and knowledge I have obtained to assist consumers from a multi-diverse population with disabilities in removing barriers, which prevent them from being successfully integrated into their communities. As well as promote self-sufficiency by providing and connecting consumers to resources available to them. Coordinated annual walking team and fundraising efforts for NAMI (national alliance on mental illness) walk. Coordinated organizations presence at relevant professional and community-based events. Facilitated patient community reintegration goals within a multidisciplinary team. Assisted patients in securing and maintaining public assistance benefits including health insurance. Coordinated and manages an assigned caseload to promote positive clinical focused outcomes. Reviewed for the appropriate level of care, resource utilization and evaluates the need for services for continuity of care. Worked with individuals, suffering from mental health and/or substance abuse. Worked along-side a nurse to refer patients from the FL hospital, into a program to help stabilize their current situation. Provided ongoing case management, to help meet the need of the client, and prevent a relapse. 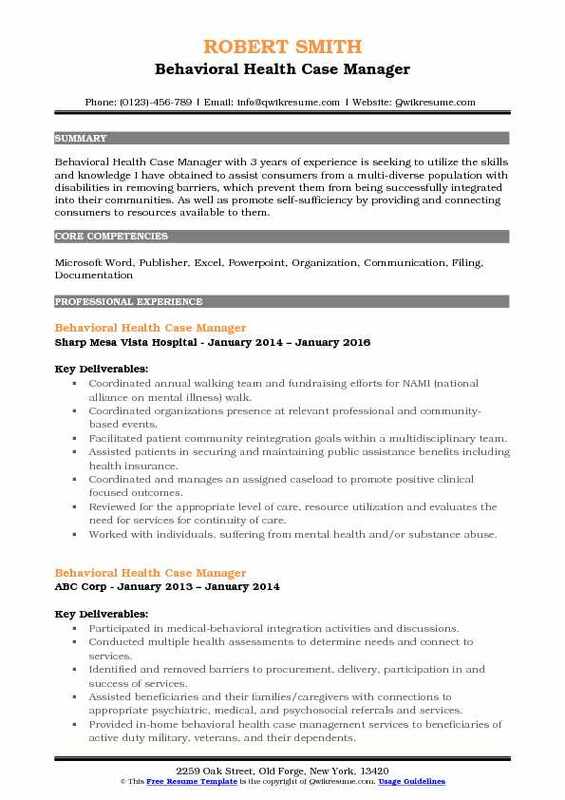 Summary : Meticulous Behavioral Health Case Manager III with 20 plus years of experience in the Healthcare domain, excellent at juggling multiple tasks and working under pressure. Broad industry experience includes Healthcare, especially managed care and government programs including Medicare, Medicaid, and military programs including Tricare. Performing utilization review - commercial, Medicare/Medicaid, military, community funded and self-pay. Participating in a variety of committees to assist with the development of workflows. Participating in training to stay current regarding best practices for behavioral health and managed care. Coordinating and certifying services based upon information received from attending physician and/or other providers using established medical criteria. Communicating and developing the care plan and serving as a point of contact to ensure services are rendered appropriately. Implementing, coordinating, and monitoring the strategies for members and families to improve health and quality of life outcomes. Acting as an advocate for the member’s care needs by identifying and addressing gaps in care. Conduct psychosocial assessments of adult patients in an inpatient behavioral health unit, including interviewing patients, family members, friends, and collaborating agencies. 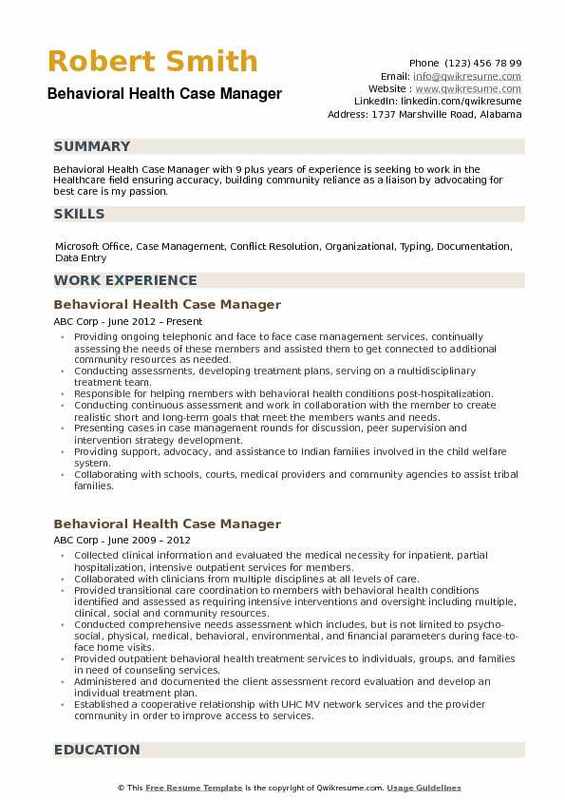 Summary : Behavioral Health Case Manager with 9 plus years of experience is seeking to work in the Healthcare field ensuring accuracy, building community reliance as a liaison by advocating for best care is my passion. Providing ongoing telephonic and face to face case management services, continually assessing the needs of these members and assisted them to get connected to additional community resources as needed. Conducting assessments, developing treatment plans, serving on a multidisciplinary treatment team. Responsible for helping members with behavioral health conditions post-hospitalization. Conducting continuous assessment and work in collaboration with the member to create realistic short and long-term goals that meet the members wants and needs. Presenting cases in case management rounds for discussion, peer supervision and intervention strategy development. Providing support, advocacy, and assistance to Indian families involved in the child welfare system. Collaborating with schools, courts, medical providers and community agencies to assist tribal families. Participating in the elder protection team ensuring elders are safe in their homes and have the supports they require to remain in their homes as long as possible.